Well, it’s that time again. A new year, new resolutions (or rehashing of old resolutions as these things tend to be). I will attempt to keep this brief and to the point. 1. Seriously. Get a life already. 2. Pay $500-$1000/mo extra mortgage principle. If can maintain, will be on track to have mortgage paid OFF in 5 years. How ridiculously awesome would that be? 3. Dance more. Dancing is fun. And good for me. 4. Eat less processed food. Drink less aspartame. 5. Keep myself on a $20/mo cash budget for alcohol purchases. Ergo forced limitation of solo intake. 6. 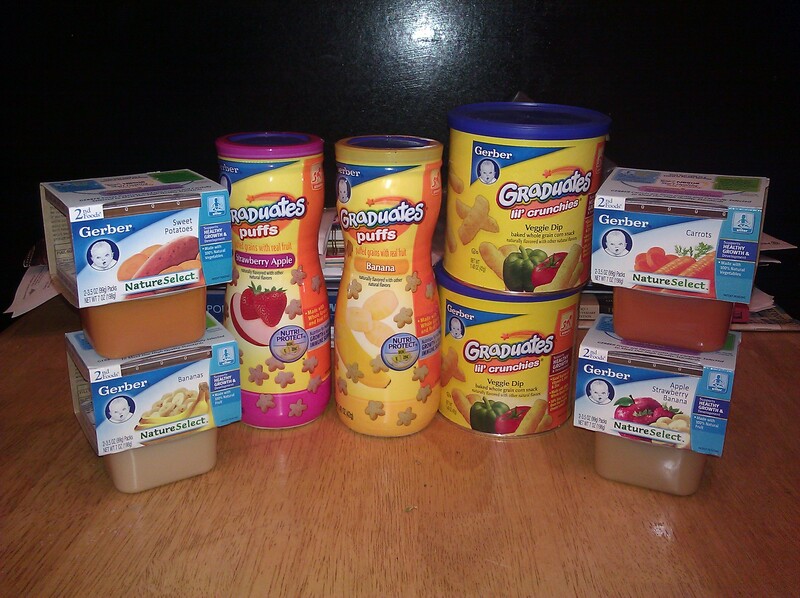 Post here weekly – once for couponing, once for life update. Or more. Heck, go hog wild and post every day if I feel like it (don’t get your hopes up). 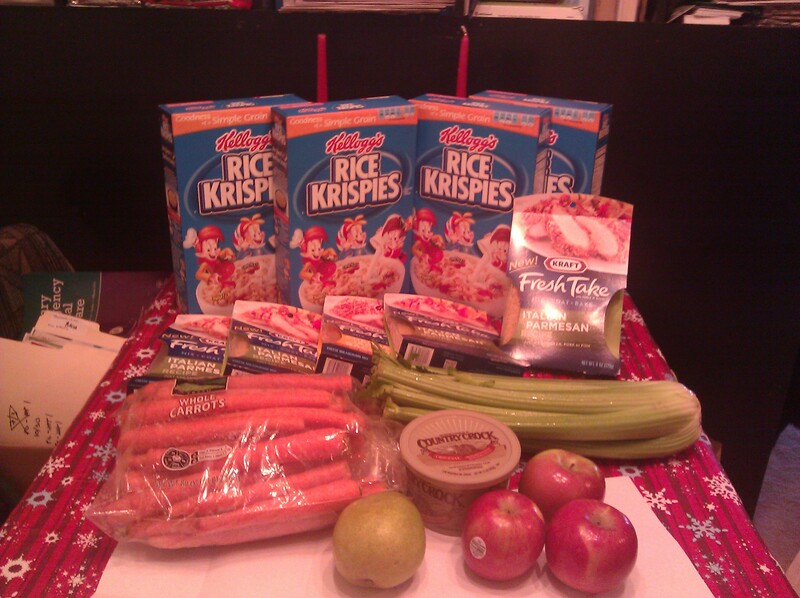 This was a much busier week, grocery shopping-wise! Lots of small trips and did a big multi-stop shop on Tuesday after my massage. It’s such a good time to do that because I have to get out of the house and I can take a route back home that hits all of the major stores so I’m not going out of my way at all and wasting gas money. Birthday was ok. I wish I could say I was super excited and it was awesome, but really I just felt kinda bleh about the whole thing. It was my 30th and while I did go out and have dinner and drinks with a couple of friends, my head just wasn’t really into the party spirit. Dinner was nice with a friend I haven’t really gotten much chance to hang out with outside of work, and then drinks started out pretty good with a couple other friends. But drinks was the sole activity (no darts, pool, etc) so I just literally sat at the bar drinking rum & coke after rum & coke and chatting a bit. The two friends didn’t know each other so that can be a bit challenging conversation wise. I dunno….it was basically just drinking with the sole intention of getting drunk….which I did magnificently. Pretty sure I was shoveled into the car by my friend Craig and shoveled into bed at home. I have a feeling that I wasn’t too good of company for him all in all, which is too bad. My personal life is in SUCH a stall right now, birthday celebrations just felt a little forced. Hopefully things improve in that department soon. More cheese! 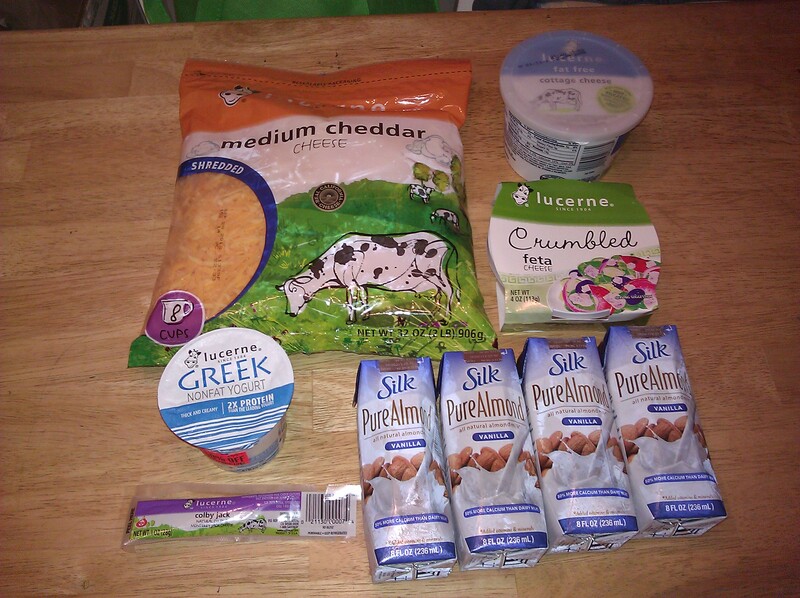 Apparently the $2/$10 e-coupon is still on my card, so with a printed $2/$10 Lucerne products coupon, all these dairy items were 40% off! 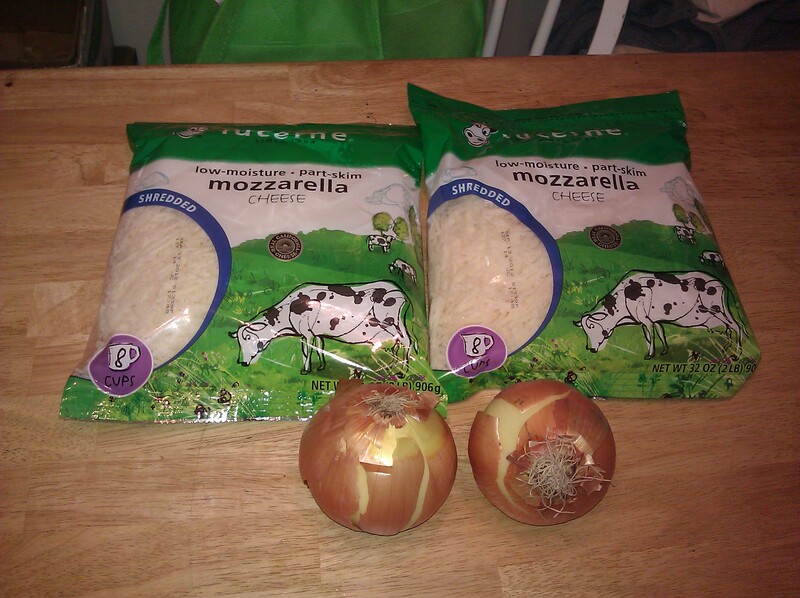 $0.75 per 80z bags of cheese (since somehow apparently I ran out of mozzarella), more feta and cottage cheese. Free silk almond milk singles too! And onions that were basically free from a Just4You pricing error. Albertson’s: $6.87 OOP, $1.87 actual cost! 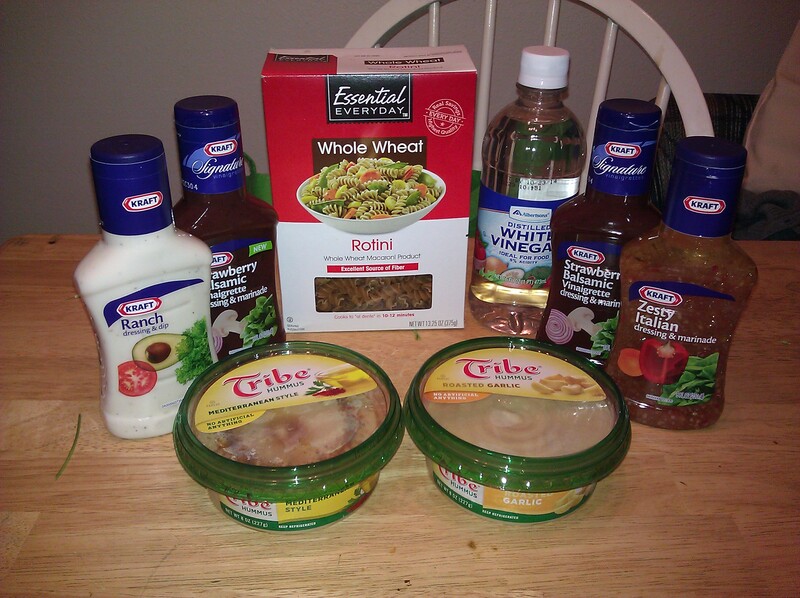 Lots of great freebies at Albies with the $1/1 Albertson’s brand coupon: pasta, ketchup, mustard, marinade. A catalina deal on the razors + deodorant, I took my $5 catalina coupon to Fred Meyer’s since I was doing some gardening purchases. See below! $1.99 baguette to take to work with bruschetta from my reclaimed produce boxes – yum! 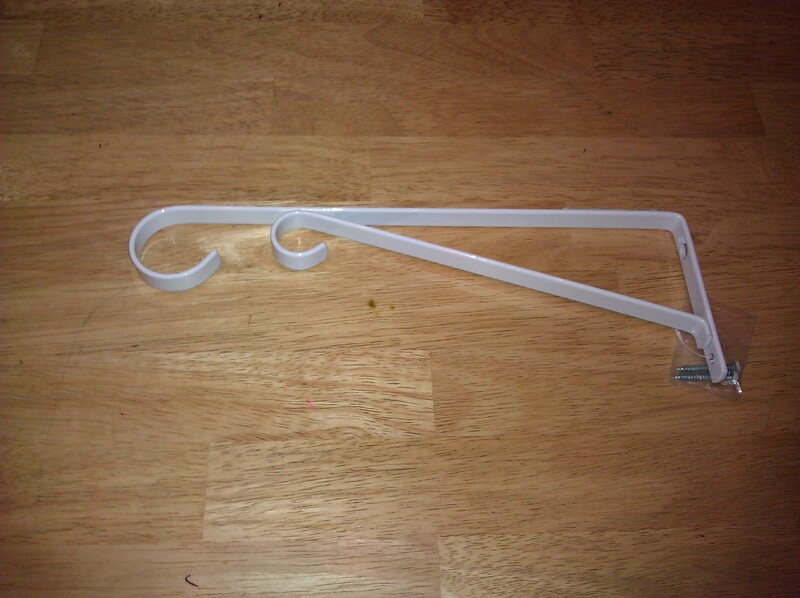 I took the $5 catalina that I earned at Albertson’s from the razor deal and used it at Freddy’s for a hanging plant bracket that I needed anyways. -Bought dog & cat food at Rite Aid capitalizing on manufacturer coupons + my 20% wellness discount and using UP rewards that I earned in moneymaking transactions to pay the bulk of the rest of the cost – paying nearly only tax OOP. 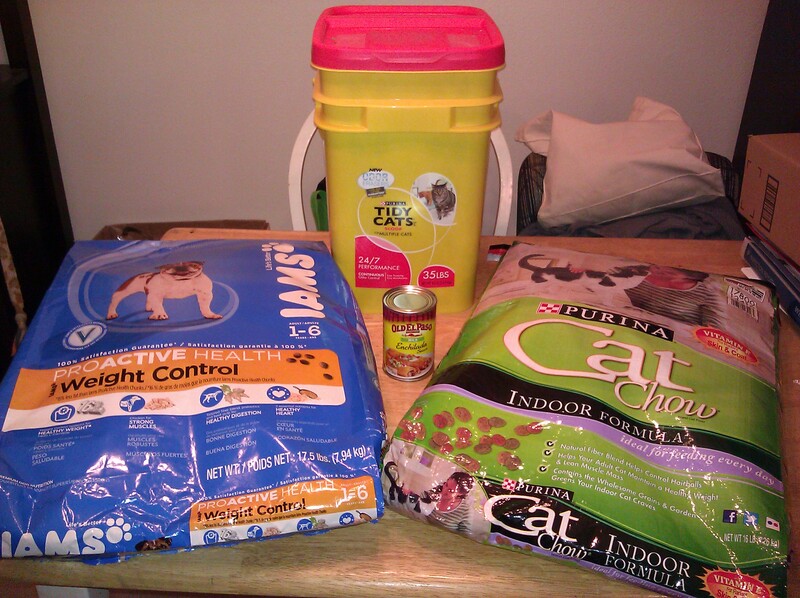 -Bought cat litter at Albertson’s on sale + manufacturer coupons + doublers + catalinas = cheap! -Bought all of the above at Target combining manufacturer and store coupons and using a gift card to pay the majority of the balance! By doing this, I have vastly reduced my OOP expenses for these items – which would typically run $40-50/mo – to less than $10-15/mo! Pet supplies are kinda like cheese and meat — always needed, generally can’t get for free, and a good place to use UP rewards or catalinas earned from other moneymaking transactions! FREE big bags of sour patch kids! BIG strawberry plant with lots of strawberries already ripening (the less likely for me to kill it off) – $5! I am now ready to plant! 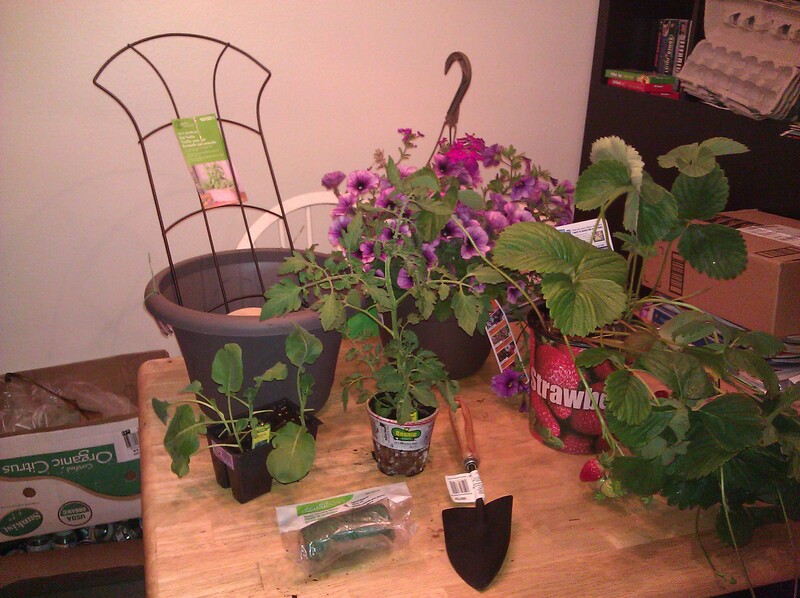 I have 2 hanging plant brackets to install, one for the petunias, one for the big strawberry plant in new basket. I have another round planter to put the tomato plant and small strawberry plant in. I have a long rectangle planter to put the snap peas & broccoli in. And lots of organic potting soil from a couple of weeks ago! I think I will stick with just this for this year. Though I *may* get another flower basket. And I’ll probably stalk for more veggies later in the summer if I don’t manage to kill all of these ones. This is definitely my most ambitious gardening year ever! Another different week in Adventures in Produce. 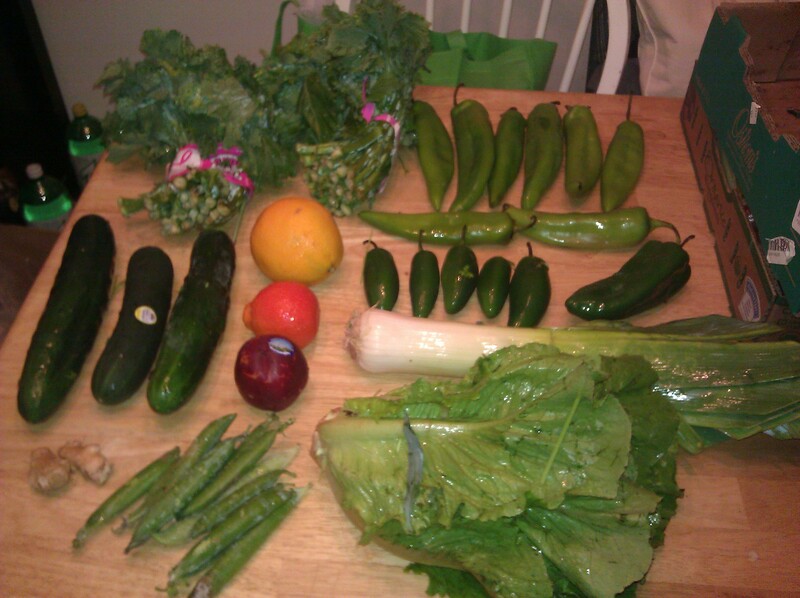 A fairly standard, though smaller selection from the local grocery. 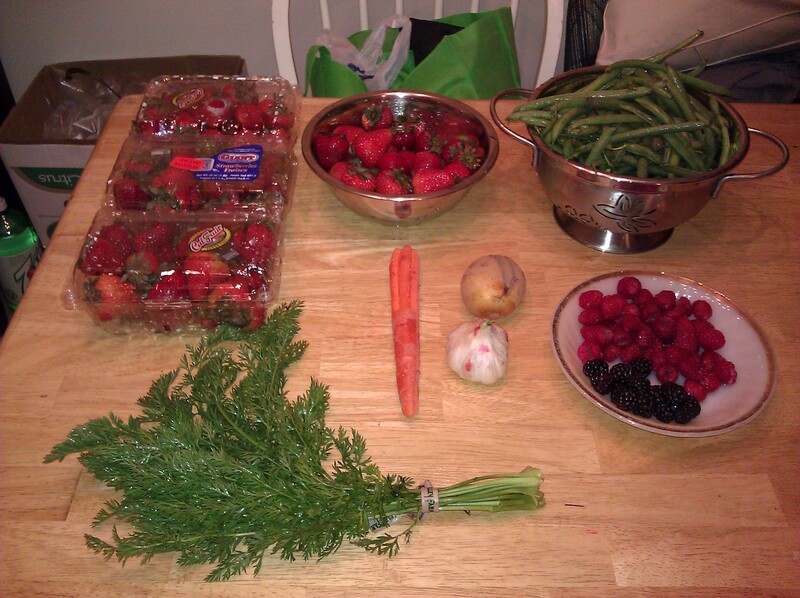 And at the natural foods co-op – fairly quiet except for the HUGE berry score! I just had an ice cream maker given to me from a coworker so I am SO making some strawberry sorbet! Oh yes I am. a few blackberries – ate them! I am making a chicken, black bean and corn layered enchilada casserole this weekend. It’s awesome to know that the tortillas were free, the black beans were $0.25, the enchilada sauce was $0.57, the chicken will be about $0.80, and all the rest of the produce was FREE! So that’s $1.62 for a 5-6 serving meal or ~$0.30 per serving! I LOVE couponing! Ok, even more shocking, I didn’t buy hardly any alcohol this week. Granted, it was my birthday Sunday and I knew I’d be going out drinking (and having it paid for/comp’d) Which was lovely. Happy hour dinner and a glass of wine my coworker friend paid for. One free drink from the bartender I know there. And then all my drinks at the casino were free because the bartender is the boyfriend of my other friend from work who I met there. So FREE birthday outing = yay! 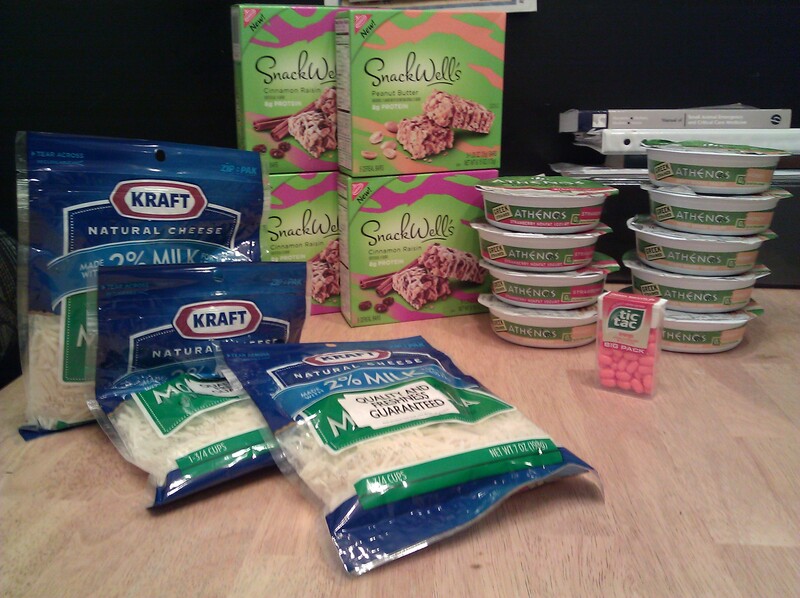 I am so excited that even with all those stops AND cheese stocking up I still managed to stay under my $25/wk budget! Course, no alcohol helps with that. Wait….there WAS a bottle of wine…..
As you may have noticed, I did NOT include the gardening supplies in that total, I just didn’t think it was fair to put it in this category. For budgeting purposes, it will go under home improvements. I am now officially on vacation for the next 10 days! What will I do? Well square dancing tomorrow night, next Saturday my friend is having a Pride party, I plan to actually plant and situate my balcony plants, and spend plenty of time in the sun in the park and at the beach (if we actually GET any). Of course, the grocery adventures won’t stop either! Ugh I am already so over this weekend. Like many of my weekends (which are Sat-Tues FYI), I accomplish darned near nothing until Tuesday and then feel like I am constantly running out of time. Big (ironic) problem this week? I actually stayed on a graveyard sleep schedule…but I have to get up at the crack of dawn tomorrow for a stupid leadership seminar thing for work, rather than my normal graveyard shift. I am bitter about this for many reasons: A. It’s a LEADERSHIP SEMINAR. B. It completely messes up my sleep schedule this week. C. I have to drive all over kingdom come to get to and from the thing. D. I lose out on about 3-5 hours of shift + differential pay. For those counting, that’s about $100 pay cut for the day for a STUPID mandatory seminar of which I will see no use. Bottle of rum….I HAD to! It was the first day of privatized liquor sales! Another quick little trip, mainly to roll UPR forward. 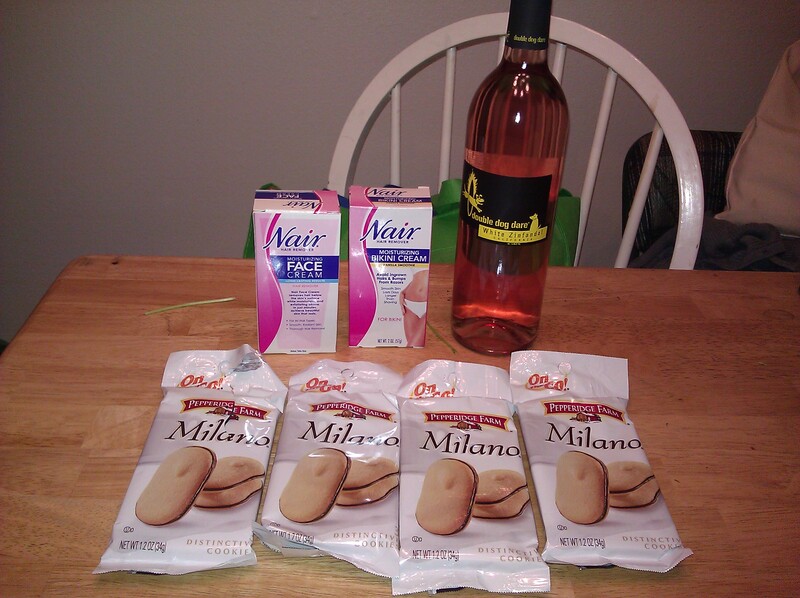 Nair, paying tax only of 0.47 and 4 packs of Milano cookies for $0.05 each (woot car snacks!) + cheap-o bottle of wine, of course. (was way underbudget again this week despite bottle-o-rum so said “why not?”. Elsewise would have skipped. Yup, that’s right – 27 cents! While definitely not my most amazing Albies trip (and DEFINITELY not the trip I planned to make THIS weekend) I am still quite happy with what I managed to accomplish with just 3 (THREE!) doublers. Albies released doublers in the Friday papers – instead of on Sunday due to the privatization of liquor release on Friday. Seems all good… until you remember that many couponers (like ME) get multiples of the SUNDAY paper in order to maximize on the coupon inserts and Albies doublers. All well and good except no one knew until Sunday that we wouldn’t be getting doublers ALSO in the Sunday paper. To be honest, I didn’t try very hard to find Friday papers to buy, just checked the recycle bin at the apartments carefully through the weekend. But the end result? Only the 3 doublers from my own Friday paper. Sigh. And it was SUCH a GOOD weekend for doublers! 4lbs strawberries- eating UP! I am SO LOVING the all-you-can-eat summer of strawberries! I didn’t eat nearly enough last year- hah! 2 – 8oz of blueberries – have to do something with these…. Another under-budget week, once again would be negligible without the alcohol. No dining out. Next weekend is my 30th birthday so there will not only be plenty of drinking, but definitely dinner on Sunday. Stupid leadership thing tomorrow, then a short 2-day week! One more week, then 10 day vacation, 2 more weeks and then I’m onto part-time! Yay bring on the summer! The Beginning of Phase Two? So work has been incredibly busy and emotionally draining the last 6 months or so. Usually in the winter we have a few months where things slow down a bit, but not this year! Good thing all in all but we are very tightly staffed so we have all been run ragged. Plus we have had a disproportionate number of very old, very sick, very not-going-to-get-better-what-the-hell-is-the-goal-here-exactly cases. These are part of ER/Critical care work but we have had SO MANY. All the time. And we have been doing SOO many surgeries at night. The last 2 years I’ve worked at this hospital I do maybe one major surgery on my shift every 2-3 weeks. The last 6 months? One about every 2 out of 3 shifts. A surgery cuts 4-8 hours out of the day so it’s a huge encumbrance to deal with. Suffice it to say, I’m a bit fatigued. It’s not exactly burn-out, I still enjoy my work and really enjoy the place I work at. But I definitely have some compassion fatigue going on and generalized worn-out exhaustion. I have a 10 day vacation in a month with plans to do a lot of nothing so that should help some. In general, I have been thinking about an exit plan for the last year or so — what to do when I no longer can/want to do clinical medicine. Today I was doing some wistful thinking about only working part-time in clinics. Seems like a far-off dream when Pets At Home had built up more, or I was burning out, or when I had enough money saved to take a plunge to develop PAH. And then I ran the budget numbers this morning. Guess what I discovered? I can go to 2/3 time. Right. Now. If I want to. What with the raises of the last year (this week was RaiseDay for the first time in 3 years at work for performance raises and I got $0.33/hr!) and new savings in grocery spending…..I am in a position to move from fulltime (3 shifts/week) to 2/3 time (2 shifts/week) – WITHOUT changing my lifestyle one teeny little bit. The only requirements? Cut my monthly savings from $1000/mo to $650/mo, drop my gym membership $50/mo (that I have been terrible about using anyways), work 1 extra shift/mo, and make at least $250/mo with PAH (or work a total of 2 extra shifts/mo). Even if I don’t take ANY extra shifts or make ANY money with PAH (not a realistic turn of events) – I would just cut my savings contribution that month and still come out ahead. This is a mind-boggling realization and very tempting! I *think* that I could likely even get away with it at work without too many repercussions. I see a definite potential for my missing shift to be covered easily, I still have private health insurance to compensate for the employer-paid, and I would still be part-time enough to qualify for lowered amounts of other benefits (paid time off, uniform allowance, CE allowance, etc). So I would hopefully lose nothing by dropping one shift/mo — and gain more sleep, more time to develop other things like speeches, CE presentations, and setting up/promoting PAH. Also would have more flexibility in my schedule to take a greater number of PAH jobs — so I can actually work towards promoting for more business! As PAH profit grows, I could if I wanted to continue stepping back from clinical practice. I think realistically I could be entirely out of scheduled clinical practice within a year or two if I desired to develop PAH that fast. My poor HR manager, she’s going to really be blindsided when I talk to her about this during my mentor meeting on Thursday. We’ve lost a number of long-term people in the last few months and have had a huge graveyard shift turnover for the 2nd time in 8 months. This is going to worry and stress her but I think it may actually be an opportune time for the clinic — I see a very easy way to staff my missing shift. Plus, this is better than totally burning out and leaving altogether. I hope she will be able to be behind me on this and we will be able to make it happen. It’s such a bizarre and thrilling idea to NOT work fulltime! And to potential be on the track to never have to work fulltime again. Sigh I am so sad to see this weekend over! After working lots of crazy extra hours every week, this was the first 4-day (aka NORMAL) weekend I’ve had in 2 months! With a 10 day vacation in one month, I was starting to get a little crazy. The weather was GORGEOUS here, the kind of really rare mid-May sunshine and warmth that makes you just want to be outdoors as much as possible. And since I didn’t have anything better to do, that’s just what I did! Ok Saturday I played with free food and I slept for like 16 hours. But Sunday I laid in the park for 5 hours, Monday for 4 then a leisurely dinner al fresco at the little Italian place for 2 hours, and today I spent 2 hours at the park and 2+ hours at the beach. I have a lovely base tan started! Read 3+ books, played on my brand new Kindle Fire, watched season finales of most of my shows, ate too many strawberries (like there’s such a thing! ), slept 12 hours a night, didn’t worry about a thing, and talked to no one save my mom on Mother’s Day. It was heavenly! So this turned out to be quite an exciting shop! 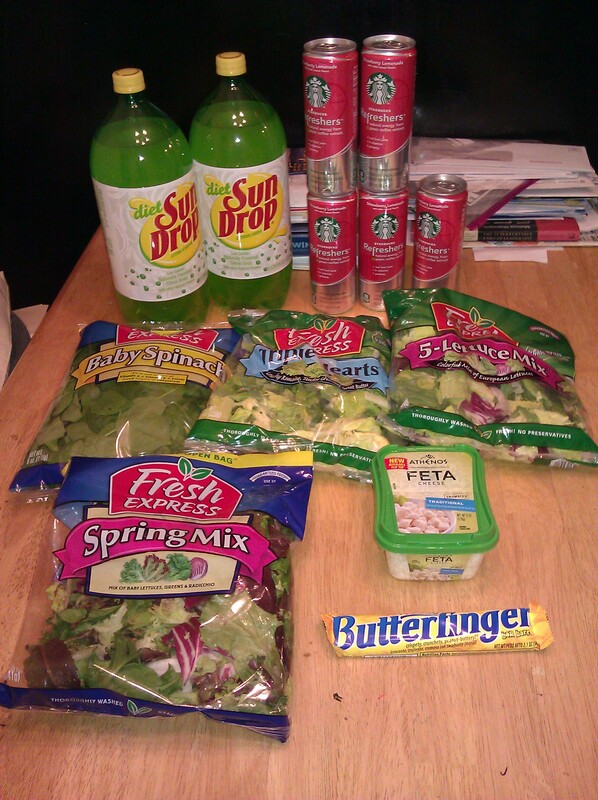 Really just went in for the free Sun Drop soda and Starbucks refreshers (which are quite good!). Happily, before I left the house I checked on my Just4U deals, Safeway’s newest promotional thingy. I had Fresh Express salad blends for a special price of $1.29 – thru tonight only! Plus, the new Safeway newsletter thingy had just been put out with $2/1 Fresh Express salad blend coupons in it. I wasn’t sure how it would all pan out with the personalized price + coupon with overage but I decided to just go for it and added a Feta cheese and butterfinger to help absorb the overage. And yay it worked! Also, the FREE coupon for the Starbucks rang in at $2.39 each even though they were only $1.50 so I got overage for those TOO! So I actually got BACK $1.22 in change. I don’t think I’m supposed to be able to do that, but the cashier was young, the line was VERY long, and the hour was late. I know that they will be reimbursed for the full value of the coupons, so I wasn’t about to cause a stink and hold up everyone to try and get it sorted. 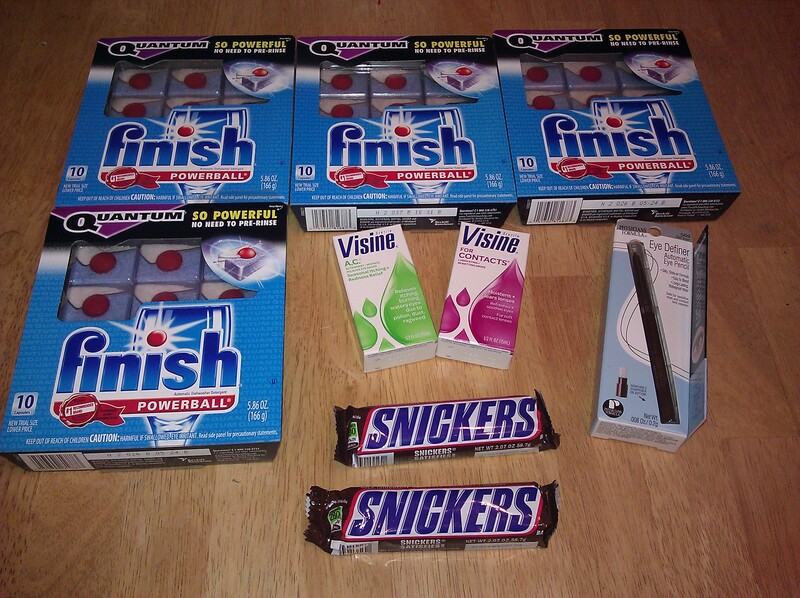 This was actually my Rite Aid trip on Saturday for the sale week before, but we’ll include it in this week. No coupons, but a UPR, a SCR, and a catalina combined to make this a major moneymaker – sweet! This was a fun, quick trip. 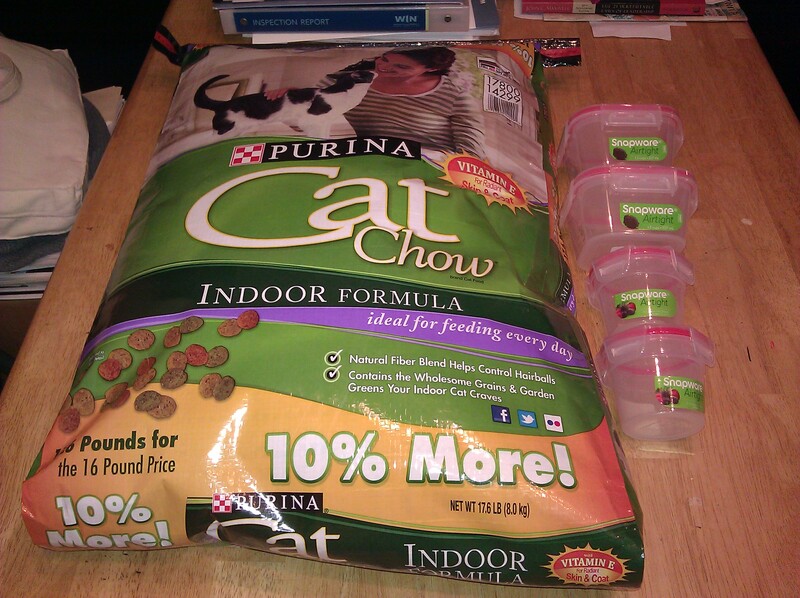 The small snapware containers were free after coupons and I used a coupon and several catalinas that I earned at other stores to bring down the OOP on the cat food. I used a $5 cat from Albertson’s (GM cereals 2 weeks ago), a $2 cat from Rite Aid (Gerber baby food) and a $1 cat from Rite Aid (visine). I am SO excited that Rite Aid gives catalinas now! And that Fred Meyer takes them from anywhere! Cuz prices on things like cat food are much better at Freddies than at Rite Aid! 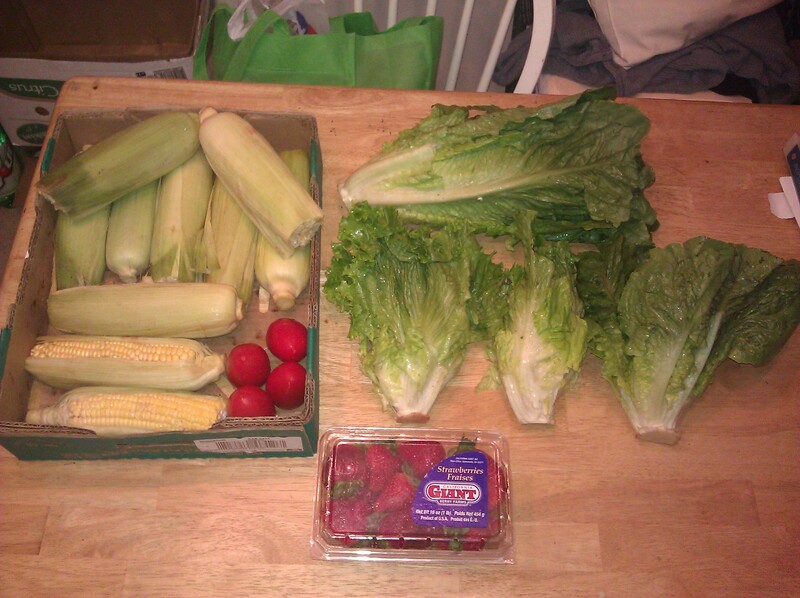 I picked up this huge bag of stuff (including lettuce trimmings) from my local grocery store on Saturday morning. It was SO heavy! I kept fishing out strawberries and filling up clamshells….out of over FIVE POUNDS of strawberries – only TWO little berries were actually too bad to save. So what did I DO with all of this bounty? Lettuce: will EAT- basically its green salads with every meal from now on! Strawberries: 2lbs were in good enough shape to last several days in the fridge for eating. 1.5lbs were sliced and frozen for future desserts/jam/yogurt. 1.5lbs I made into strawberry syrup – 1/4 of which is already gone in strawberry lemonades and on top of waffles! Weekly Total: $6.95 – SERIOUSLY! I treated myself to dinner at the Italian restaurant sitting outside in the shade on the patio on Monday night. 2 glasses of wine w/ an amazing veggie & penne dish and 2 lovely hours spent basking in the warm spring air reading on my Kindle – perfect! This week in conservative couponing…..
Ok, so as you may have realized, one of the key aspects in my great house plan 2012 is to cut back on my grocery budget. WHAT? you say? You’re already a crazy coupon lady! How are you going to save MORE? This sounds worrisome.What I realized though, is that while I AM saving a TON of money off of shelf price (and even sale price many times), I still was buying too much stuff and spending money on things I wouldn’t use or was going to give away. (Even if it did seem like little amounts here and there) Little amounts add up, especialy when you shop multiple stores every week. And since it does seem like so little, it is easy to lose track of. And then you realize that as a single person who does NOT eat out a ton or buy fancy expensive food….you’ve still managed to spend over $300 per month on food in the last year. Which is just…..not necessary. So I am officially cutting back. 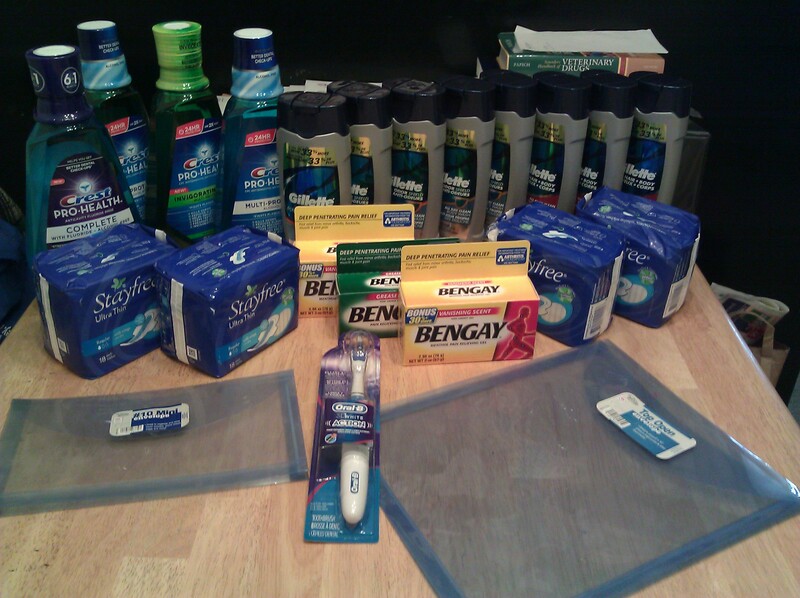 I was already cutting back a bit at the drugstores especially because I know that I am fully stocked on household/toiletries for like 6-18 months. I have for the most part been managing to only buy free or moneymaker items there. Now I am cutting back on food spending too. This doesn’t mean that I am going to change the way I eat or start subsisting on ramen and peanut butter and rice. It just means I will eat from my freezer and stockpile, buy produce mindfully, and coupon carefully and consciously. 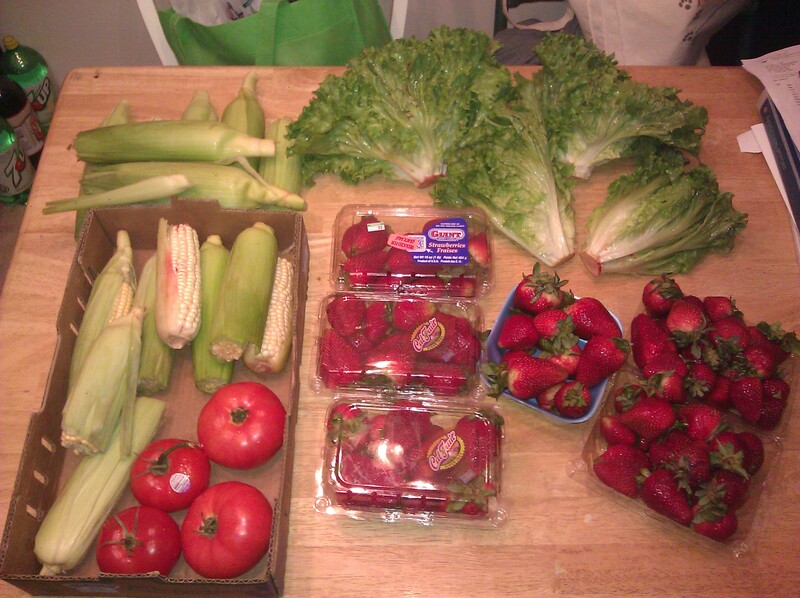 Last week was an excellent start….mostly because it was a quiet week at the stores so I didn’t buy much. This week was busier, but look how well I did! 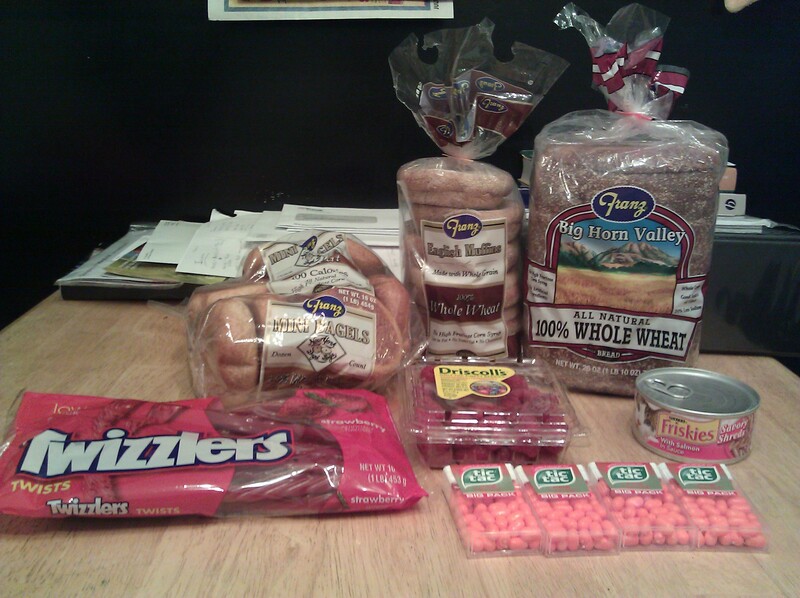 I shopped at 3 stores: Albertson’s, Safeway, and Fred Meyer. It was a doublers week but with my new guidelines….it was so slow! I had barely enough items on my original list to use all the doublers I get with my newspaper subscription (18) and one item was out of stock, one was an incorrect coupon, and another I couldn’t find at all. In the end, I only used 8 doublers and gave the rest away at the store for others to use. Time to use up my rainchecks that had coupons that expire on 3/31! I had a raincheck for POM juice and one for (6) Fresh Express salad kits. I LOVED these kits 2-3 weeks ago when I first got them. I spent a couple weeks eating my first 6 bags, then took a week off and cleared out some other food from the fridge. Now ready for more! Luckily another great sale came along to take advantage of also…. PLUS!! I got a catalina coupon for a free milk up to $4 for buying 4 Kellogg’s items! Sometimes these coupons will scan for a flat $4 rather than have the cashier enter in the actual amount of the milk….so it could be a moneymaker item. I was quite torn between Fred Meyer and Safeway this week in regards to using my (2) $4/4 Kellogg’s coupons. Such great deals either way. I decided to split and do one at each to get a little of each store’s promos. 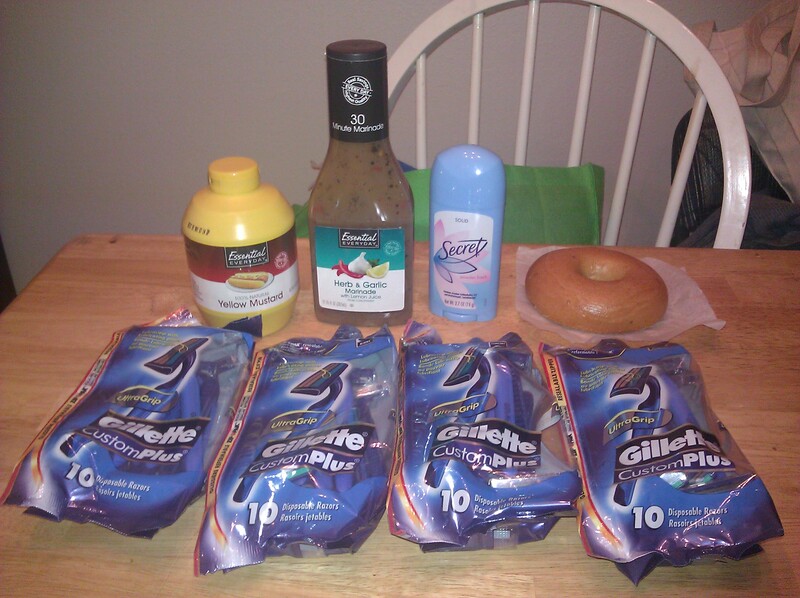 Fred Meyer was doing a Save $5 instantly wyb 10 items promo which can be a pain to get the right number of qualifying items to coupons to end up with a great deal. An amazing deal came my way though this week! Total: $7.90, received a $4 catalina from Kraft cheese! My grand total for the week? I have spoken with a real estate agent, he will be keeping an eye out for potential properties and be ready for me whenever I see something I want to look at or know more about. I spoke with a mortgage broker, she is very optimistic that I should qualify for a very good interest rate and possibly even a 5% downpayment (though I want to put down at least 10%). I don’t think that I should have trouble getting finance for the amount of loan I am looking at as I am pretty conservative in my own wishes. I have a list of documentation to gather for her….including the lease for my tenants (which I need to revise and send to them to sign and send back) and my 2011 taxes (which I haven’t done yet – eek!). So it will probably be a week or two for me to get that all put together for the preapproval. Which is fine! I also looked at my expenditures last year for groceries/household items/pet items/dining out. They were MUCH higher than I had assumed! I spent on average $311/month on these categories combined. Yikes! 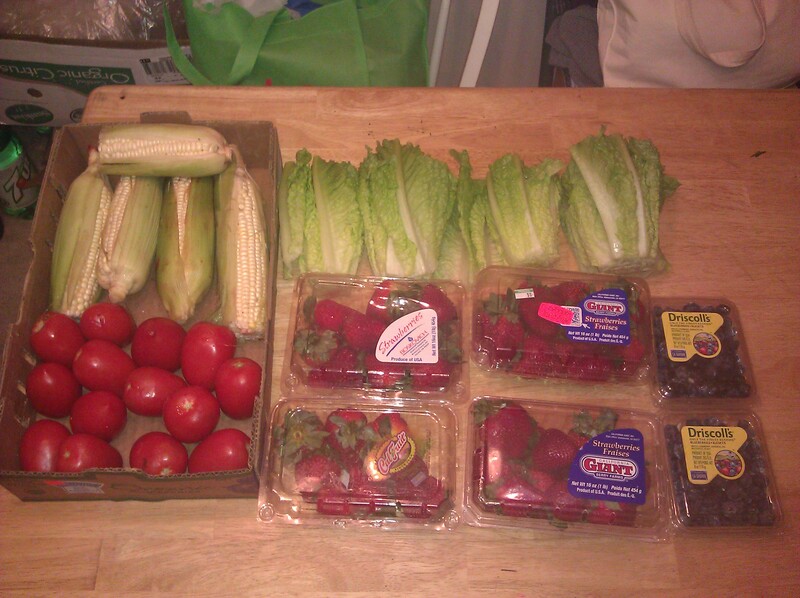 While I was saving with couponing over shelf costs, I was still buying more than normal + lots of veggies. I also ate out quite a bit more than my usual last year what with going to the little Italian restaurant by my house to study and also once a week to study group as well as on vacations. The good news? I have a fully stocked house and plenty of room to cut back and save money here! My original plan was to cut back by $50/mo but now I am aiming to spend only $180/mo on these categories – a savings of $130/mo. Directly saved so far: $580 + $120+ in grocery savings. Woot woot! We are well on our way! For quite a while (probably about a year now) I have been rolling around the idea of possibly buying a house. Now, mind you, I ALREADY own a house. It is about 2 hours south, in the “country”. I bought it 8 years ago in 2004 just after I graduated from college. It seemed like a good idea at the time, and it has turned out to be a fantastic investment that I have not regretted for a second. I am so glad I bought it when I did. The house is a good little house but the job market within commuting distance kinda dried up as I grew up and moved up in my career. 2 years ago I left the house behind, found trustworthy faithful long-term renters to take care of it, and moved north, back into an apartment. I like my apartment. I LOVE the location in a small waterfront town just north of Seattle and only 20 minutes or so from my job. My windows overlook a treeline and burbling creek (drainage stream). I am one door down from the lovely city park. I am 4 blocks off of the quaint downtown area, and only 6 blocks from the waterfront. This town buried in surburbia only steps away from the big city has a small artsy community feel to it. I have fallen in love. Affordable houses are not easy to come by There are plenty of aparmtents, and condos in all price ranges. But houses? They tend to be more spendy….in the 200,000-500,000 range. I can’t afford a 200,000 mortgage….or the 20-40,000 for a downpayment on one. I wasn’t totally sure that I could either afford to buy a house here, would want to save that hard and long for a downpayment, or even REALLY wanted to buy a 2nd house. I had already decided I wouldn’t sell my 1st house. I love it too much and plan to “retire” there eventually. But my circumstances have changed for the better recently. I got $3/hr in raises this fall. I am refinancing my 1st house into a lower interest rate, saving ~$80/mo. I upped my tenant’s rent. I have areas where I can cut spending. My business is well grounded and has some level of reliable minimum income. I no longer HAVE to take extra shifts to meet my budget. So there is suddenly some flexibility that allows for more substantial savings with less extra work and less time required than just a year ago. So I have started on the steps towards buying a house. I want it within about a mile radius of where I am now, which is a quite small area to be searching. I want it for $150,000 or less, which means I will not be buying a fair market value house. I will definitely be buying a bank-owned, foreclosed, auctioned, or short sale. So I will have to be very very careful with inspections and what I am willing and not willing to put up with. It will likely take several months to even find a handful of possibles. It may easily be a year or more before I find the right house. Which is fine because it gives me more time to save for the downpayment. The longer it takes to find the house, the more money I will have saved, the larger downpayment I can put down, so the higher priced house I can buy, leading to more houses in my price range. On the other hand, I do have enough existing savings that I could put down a 10% downpayment (if I finangle that approval-wise) on a 130,000 house right now. If the perfect one appeared. I just paid myself my first paycheck!!!!!! EEEEEEEeeeeEEEE!!! lol, I know, you’d think I’d never worked a day in my life. But this is the first check I have made out to myself from my own business. Yes, it’s officially been open for nearly a year (October 1st, 2010 if anyone wants to know). And yes, I had already “turned a profit”…..since there is almost no overhead, so I could have been paying myself before now. But since I did not fund this business with any capital, I wanted to make sure there was a little bit in the bank account to help get things set up more in a few months. July was the 1st month that I calculated the gross income and then made out a check for the 75% that I had determined so long ago would be my percentage when working a job personally. My current monthly household budget requires me to make an extra $600-800/mo. (Without counting any PAH income) Which is 3-5 relief shifts, depending on day vs. night, overtime vs. outside clinics, length of shift. As it stands now, that $600 paycheck I just paid myself is equivalent to 2 overtime graveyard shifts or 3 overtime day/swing shifts! Plus, I am on track currently for August to receive a paycheck from PAH of $450 even if no more clients appear before the end of the month. And I have already scheduled $500 worth of overtime relief shifts, plus 2 days of on-call that if called I am called in, will result in a minimum of $100 each, up to $200 each. So I am well situated for August, and in September I am not currently scheduling any extra shifts! I am just so happy that the business is going well, despite the little efforts I have made to grow it. I have several returning clients and that is the best recommendation of all. It was quite a busy week around town. And besides shopping, I had a busy week elsewhere! This weekend was my rotating Saturday night shift and I have a client on Saturday mornings that requires 2 hours driving time (roundtrip), then there was 3 different store with coupon deals that required shopping on Sunday due to coupons that expired that day. Sunday night I had to do all my reading and prepwork for study group on Monday night, I had to go to my client again first thing Monday morning, 5 hours sleep, then study group, then I had picked up an extra shift that night. Swung by 3 more stores on the way home today. Phew! I now have 2 days off and a long list of chores that need to be done!! But no more shopping until next week!! I swear! So I did a lot of couponing this weekend. It was a doubler weekend at Albertson’s and I stopped in 3 times. 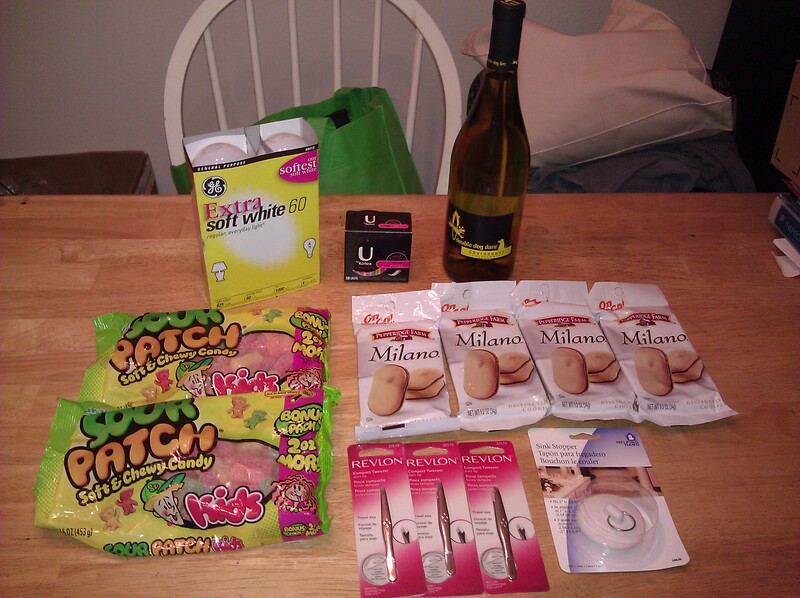 Plus one trip to Safeway, one to Top Foods, one to QFC, a HUGE trip to Rite Aid, and a trip to Walgreen’s. This is a VERY NON-typical week for me! I nearly always have at least one trip to Rite Aid & Albertson’s, 2-3 trips to Albertsons on doubler weeks, and here and there to the others, with rarely going to Walgreen’s or QFC. And yet, somehow this week there were amazing deals at each and every one! It’s funny because I had just taken a huge amount of groceries/toiletries into work which were snatched up quickly by the coworkers. And in just one week I’ve made huge progress in rebuilding my surplus pile! At least I’m putting those newspaper subscriptions to good use! Something that I have commented briefly on in the past is that I don’t want to get so wrapped up in the “deal” that I lose sight of what I am buying and exactly how much money I am spending. If I have 20 tubes of toothpaste in my surplus pile, I can skip some deals. And if it is an item that I won’t be personally using, even if it’s a good deal, if it costs me money, that’s still money that I am throwing away. Also, I am trying to make a more conscious effort to eat healthier. Yes, I love chips. And candy. And various junkfoods. And yes there are plenty of good deals on those. 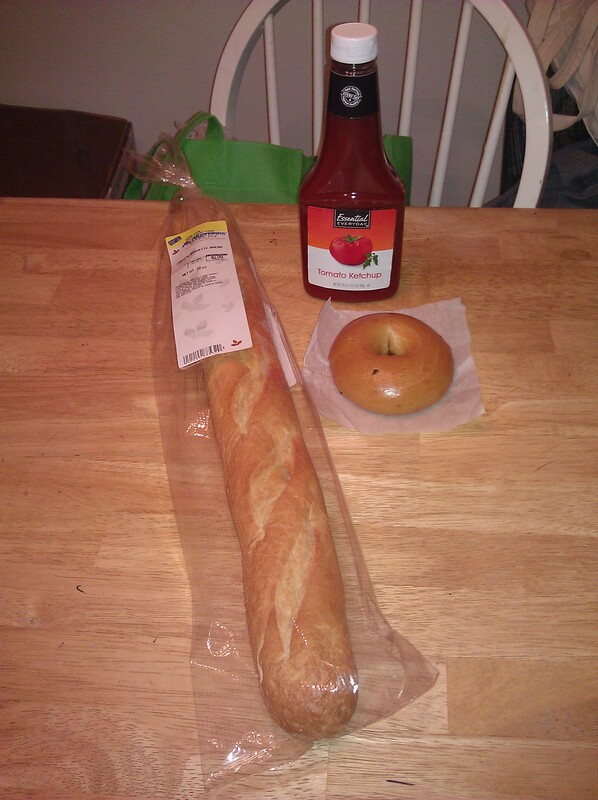 But I don’t want to be eating large amounts of those type of foods, so I am learning to pass up those deals also. There really are great deals out there for healthy foods! If I ever had time (hahahhaaha) I think I would put together a couponing blog focusing only on healthy lifestyle couponing. I actually needed to get cat litter, and the cereal was 0.49ea and will make an excellent healthy snack item. 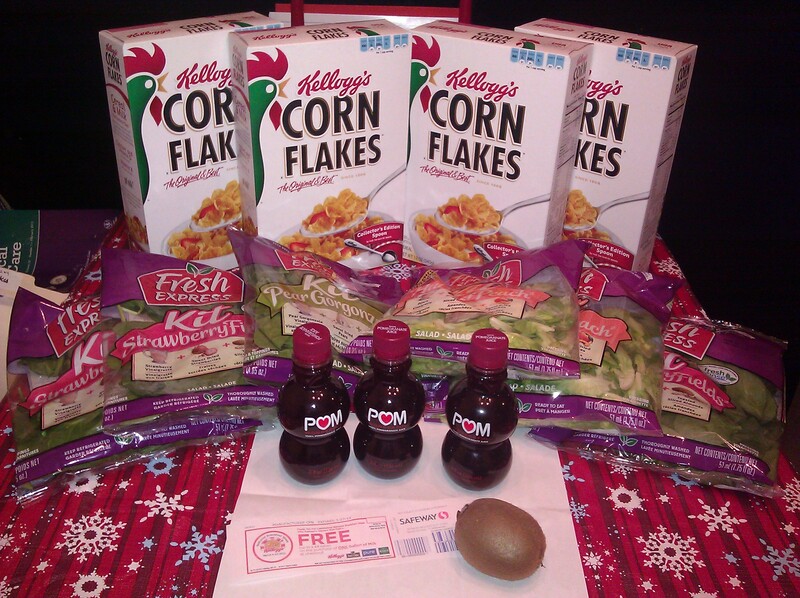 Plus each box came with $5 worth of coupons, including $1 off fruit wyb 2 boxes any Kellogg’s cereal – doesn’t expire til March 2012 so will definitely happen upon more cereal deals before then! So really it’s like I made 0.51 on each box once I redeem the free fruit! 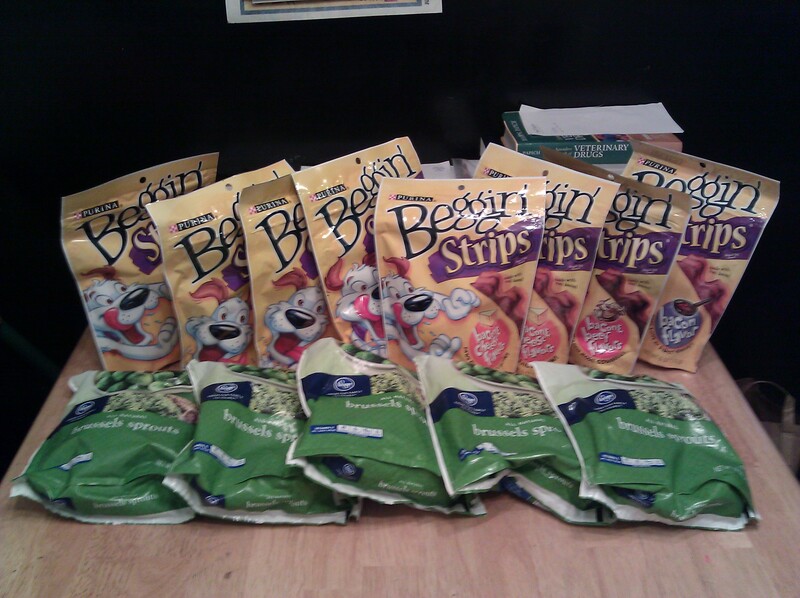 The Beggin strips will go to work to keep patients very happy (I saved a couple of bags for Emmy). And I actually love oven-roasted brussel sprouts and they are never included in the $1 sales that Albertsons and Safeway have! So I am very excited by this one! 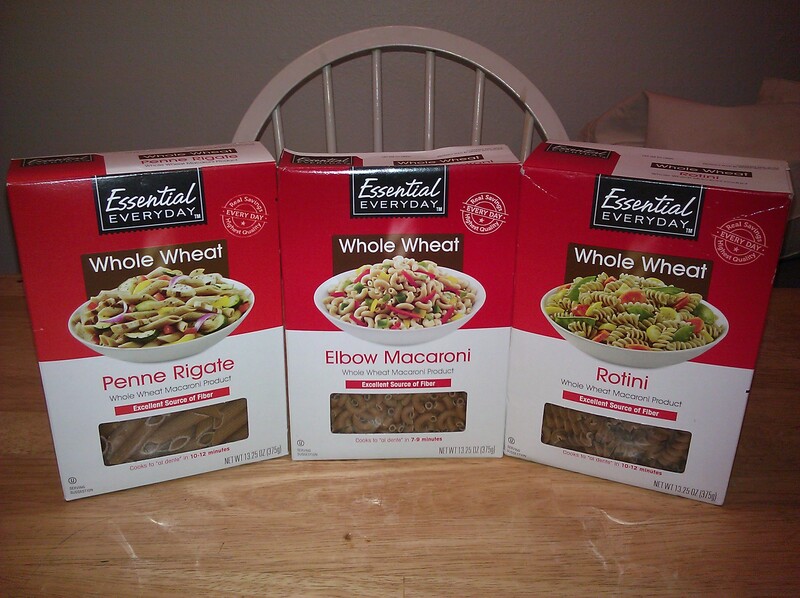 Great cooking/snacking essentials at rock bottom prices! 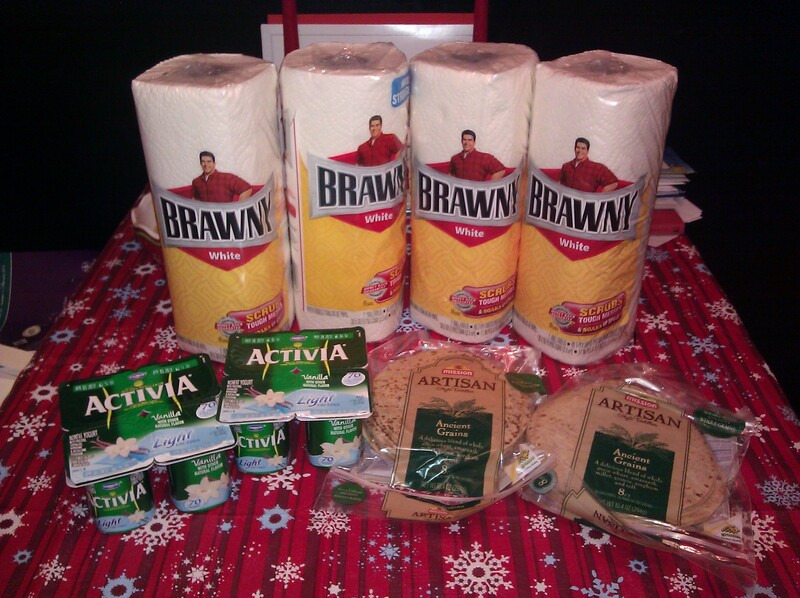 Less than $2ea for the TP, donated the school supplies. Rite Aid – $8.83 MM! Final Trip Price: $8.83 profit! !